The starting point for Spectres is the murder of Patrice Lumumba a few months after his election victory in the Congo in 1960. For TRACK, Augustijnen sought in vain for the tree against which Lumumba was shot. It had probably been chopped down to make charcoal. 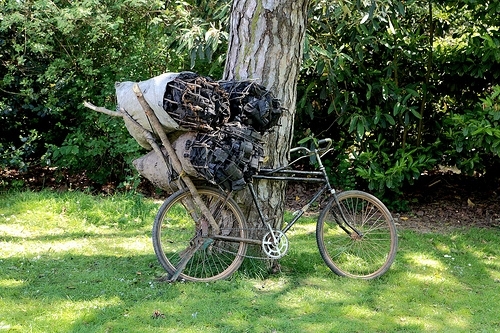 In the Citadel Park (Ghent), Augustijnen sets up an installation in which this charcoal – an indispensable source of income but also a symbolic remnant of the tree – is transported by bicycle, a ‘typically’ Congolese means of conveyance. Augustijnen deliberately located this installation near the ‘Moorken’. This small black sculpture on top of artificial rocks in the Citadel Park dates from 1888 and is a reminder of the time when the Congo was still Leopold II’s private pleasure garden. The ‘Moorken’ portrays the Congolese boy Sakala, whom the pioneer Lieven Van de Velde brought back to Belgium in 1884.